Nonpolio enteroviruses cause an astronomical number of infections per year. More than 90% of enteroviral infections are either asymptomatic or cause a nonspecific febrile illness. A wide range of symptoms is observed, but most cases include fever, a viral prodrome, and gastrointestinal symptoms. Patients with nonspecific febrile illness, the most common form of enteroviral infection, present with a sudden onset of fever, temperature ranging from 38.5-40°C. Accompanying symptoms include general upper respiratory and GI complaints. Clinical indicators include a flulike syndrome consisting of malaise, myalgias, sore throat, headache, conjunctivitis, nausea, emesis, and diarrhea. Genitourinary manifestations such as orchitis and epididymitis are possible. Symptoms generally last 3-7 days and are caused by all enteroviral subtypes. Herpangina occurs in children aged 3-10 years. These patients report painful vesicles on the posterior pharynx and tonsils. These lesions are associated with fever, sore throat, odynophagia, and other viral symptoms. Mothers may notice a decreased oral intake by the child due to the painful ulcers. The causative agent is most commonly coxsackievirus group A and, sometimes, coxsackievirus group B. Herpangina is self-limited, and symptoms last 3-7 days. Hand-foot-and-mouth disease is a vesicular eruption in the oropharynx, palms, soles, and interdigits of toddlers and school-aged children. The oral vesicles are not usually painful. Patients often present after 1-2 days of fever and have a characteristic viral exanthem. 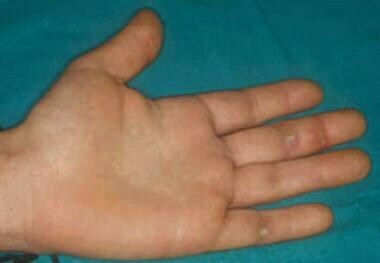 Lesions are more common on the dorsal surfaces of the hands and feet than in other locations. The most common causative agent is coxsackievirus group A, serotype 16, but strains of enterovirus 71 circulating in East Asia are currently causing outbreaks of hand-foot-and-mouth disease (HFMD) that are associated with a serious rhombencephalitis, with significant mortality. Atypical HFM disease was recently reported around the globe and is caused by coxsackievirus A6. It is characterized by a relatively paucity of oral lesions, but a striking bullous eruption on the extremities. Children with eczema may be more affected and "eczema coxsackium" was coined as far back as 1968 for this condition. Postinfectious loss of the nails is reported frequently. Viral exanthems, a frequent cause of emergency department visits, manifest as rubelliform or roseolalike rashes that occur in the summer months. These exanthems occur in children younger than 5 years and have a benign 3-day to 5-day course. The responsible agents are usually echoviruses. Patients with aseptic meningitis have symptoms that mimic the initial symptoms of nonspecific febrile illnesses, but, as aseptic meningitis progresses, patients report a headache, stiff neck, and photophobia. A nonspecific rash can accompany these symptoms, raising the question of meningococcemia. The clinical course of aseptic meningitis is self-limited and resolves in 1-2 weeks. The coxsackievirus group B and echoviruses are responsible for 80-90% cases in which a causative organism of aseptic meningitis is identified. Neurotropic strains, such as enterovirus 71, can be responsible for more aggressive cases of CNS infections. Ninety percent of some cohorts with enterovirus 71 infection also had rhombencephalitis. This can lead to neurogenic pulmonary edema and has an overall fatality rate of 14%. Early signs of severe infection include myoclonus and sleep disturbance. Fever that lasts longer than 3 days duration, high fevers (>38.5C), and lethargy are predictors of CNS involvement. Patients with myocarditis or pericarditis report chest pain, fatigue, and dyspnea on exertion. These symptoms can progress to dysrhythmia and heart failure. The most common cause of cardiac involvement is coxsackievirus group B5 infection, but echoviruses are also etiologies of infection. Pleurodynia (Bornholm disease, devil's grippe) is an uncommon epidemic that causes severe muscular pains in the chest and abdomen. These sharp pains worsen with breathing or coughing and are associated with profuse sweating. Spasmodic muscular pains last 15-30 minutes in older children and adolescents. The condition can mimic serious surgical conditions and can cause periodic episodes of respiratory difficulty. These symptoms are accompanied by fever, headache, anorexia, nausea, and emesis. Symptoms last for 2 days. Coxsackieviruses B3 and B5 infect the intercostals muscles, causing these frightening but rare outbreaks. Neonates with nonpolio enterovirus infections are at a high risk of developing a sepsislike condition, including meningoencephalitis, myocarditis, and hepatitis. Presenting symptoms include poor feeding, lethargy, fever, irritability, hypoperfusion, and jaundice. Differentiating these infections on clinical grounds from bacterial sepsis is impossible. Infants younger than 10 days are unable to mount a significant immune response and are at a higher risk of a serious infection from echoviruses and coxsackie group B viruses. A history of a mother who had a febrile illness with GI symptoms around the time of birth is often reported; this acute presentation results in exposure to viral shedding without significant transplacental transfer of maternal antibodies. Poliovirus infections are divided into 4 groups of clinical syndromes: asymptomatic, abortive, nonparalytic, and paralytic. Most infections (90-95%) are asymptomatic. Abortive poliomyelitis involves a nonspecific febrile illness that spares the CNS and spontaneously resolves after a few days. Temperature is not higher than 103°F. Patients report a minor febrile upper respiratory infection, such as cough and sore throat, and gastrointestinal infection with nausea and diarrhea. Patients with nonparalytic poliomyelitis (aseptic meningitis) present in the same manner as patients with abortive poliovirus, but nonparalytic poliomyelitis progresses to aseptic meningitis. During the initial flulike illness, patients report stiffness in the posterior neck muscles, limbs, and trunk. This minor viremia is followed by nuchal and spinal rigidity, the hallmark of nonparalytic polio. Paralytic poliomyelitis starts with a nonspecific febrile illness and muscle weakness that resolves after 2-3 days but is followed by a sudden onset of asymmetric flaccid paralysis. Pain, nuchal rigidity, and hypertonia are indicators of brainstem, spinal ganglia, and posterior column involvement. Bulbar poliomyelitis involves the speech and central cardiorespiratory centers of the brain stem and can cause death because of cessation of cardiac and respiratory activity. Nonspecific febrile illness can include normal findings on physical examination or can include an erythematous pharynx, mild conjunctivitis, and cervical lymphadenopathy. Patients with herpangina present with punctate macules that progress to vesicles that eventually ulcerate. Usually, 3-6 erythematous vesicles about 1-2 mm in size are found on the posterior pharynx, anterior tonsils, and soft palate. The oropharynx may be erythematous, but no exudates are present. Patients with HFM disease present with less painful or painless vesicles that may ulcerate on the buccal mucosa and tongue; the less significant pain differentiates the vesicles of HFM disease from the posterior pharyngeal vesicles of herpangina. See the image below. In addition to the oral findings, an exanthem of vesicles appears on the palms, soles, and intertriginous digits of the hands and feet. These vesicles heal by resorption of fluid and do not crust over. See the images below. Occasionally, nonvesicular eruptions are present on the buttocks, proximal extremities, and genitalia. The truncal area is not usually involved, differentiating HFM disease from varicella infections. The absence of gingival erythema, high fevers, and lack of significant cervical lymphadenopathy aid in distinguishing HFM disease from herpetic gingivostomatitis. Viral exanthems appear as a pink, maculopapular, blanching rash that can mimic rubella and roseola. This rash is less commonly vesicular, urticarial, and petechial. Unlike rubella, no significant adenopathy is present. Similar to roseola, it may appear following the cessation of fever. Atypical HFM disease tends to present with bullous lesions on the extremities and may be more severe over areas of preexisting eczema. The lesions are not limited to the hands and feet and may be seen on the arms and legs. Aseptic meningitis reveals physical findings consistent with meningeal irritation, including nuchal rigidity, a bulging fontanel, and, possibly, positive Kernig and Brudzinski signs in children older than 1 year. The accompanying rash is often nonspecific but can occasionally be petechial. Myocarditis and pericarditis symptoms depend on the severity of the disease. The physician should look for signs of congestive heart failure. Patients with pericarditis may have an auscultatory friction rub, Hamman crunch, and poor perfusion. Patients with pleurodynia (Bornholm disease) may present with respiratory distress or in a shocklike state. Patients may localize pain in the abdomen and may have tender abdominal muscular walls. A pleural friction rub may be auscultated during the muscular spasm. Patients with acute hemorrhagic conjunctivitis present with subconjunctival hemorrhage, erythema, lacrimation, chemosis, preauricular lymphadenopathy, and serous eye discharge. Some of these cases may progress to a bacterial conjunctivitis with purulent ocular discharge. Neonatal infections cause the infant to be irritable, lethargic, and inconsolable by the mother. 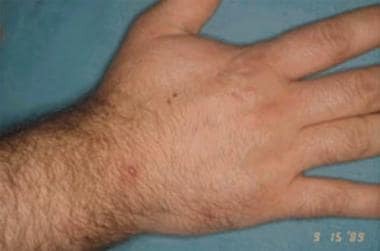 The infection can progress to signs and symptoms that reflect hypoperfusion, such as cool mottled skin, delayed capillary refill, and ashen gray color. Polioviruses should be differentiated into their subtypes. Abortive (nonspecific febrile) illness appears as a general viral upper respiratory and GI infection. Cough, coryza, and pharyngeal exudates are common. Patients with nonparalytic (aseptic meningitis) illness have a nonspecific viral picture, but the physician should recognize symptoms of meningeal irritation. Increase or decrease of the superficial and deep tendon reflex usually occurs prior to onset of weakness. If these reflexes are decreased, the physician should be wary of impending weakness and paralysis. As with all types of polio, sensory examination findings remain intact. The paralytic form is similar to the nonparalytic with the additional classic finding of asymmetric flaccid paralysis. Proximal muscle groups are usually more affected than the distal musculature. Deep tendon reflexes are decreased or absent, and sensory findings are unchanged. Associated symptoms include hypertonia, respiratory and cardiac arrhythmias, and blood pressure and vasomotor changes. Observe for symptoms of respiratory distress, including difficulty speaking, nasal flaring, tachypnea, and immobility of accessory muscles of respiration. Impending respiratory failure may rapidly occur. Enteroviral risk factors include poor sanitation, crowded living conditions, and lower socioeconomic class status. In addition, children younger than 5 years are more susceptible because of poor hygiene habits and lack of prior immunity. Although debatable, neonatal infections are most likely acquired after birth rather than transplacentally. Exposure from an infected mother or another infant in the nursery during the first 2 weeks of life is the probable mode of transmission. The enteroviral exposure may be perineally acquired during the delivery process. A B-cell response is needed for the host to properly fight off the enteroviral infection and to prevent entry to the CNS. Children who lack a functioning B-cell system, such as those with X-linked agammaglobulinemia, are at risk of serious enteroviral infection, such as meningoencephalitis. Poliovirus is a consideration in all unimmunized or partially immunized children.